Who implements the Distance Learning Program? This individual serves as the teacher who actually instructs the student using the provided materials. A parent with a high school diploma and some academic credit beyond high school may be the Mentor. Individuals other than a parent may serve as the Mentor provided they hold a college degree. This individual administers the tests which will be mailed directly to him/her. Further, the Test Proctor certifies that proper testing procedures were followed and that the student actually completed the test. The Test Proctor cannot be the student’s parent. If the Mentor is someone other than the parent, then he/she also may serve as the Test Proctor. A Test Proctor must hold a college degree. How do we get started with the Distance Learning Program? Determine who will serve as the Mentor and Test Proctor. Then simply print out and complete the application packet, including the Course Selection and Request for School Records forms. You must be able to answer all questions “yes” on the application in order to begin the program. Select the courses desired, compute your tuition as indicated, and mail the application packet, Mentor and Proctor documentation, and tuition check to the address shown. What does the Distance Learning Program provide? Upon receipt of a completed application packet and check, Eaton Academy will order and ship to you all required materials for the course(s) you have selected. Once each Life Pac Booklet has been finished, the Test Proctor is to mail in the test for grading. Upon satisfactory review of the test (students must finish with a test average of at least 80%), Eaton Academy will record and email grades back to the parent. Properly completed Life Pac Booklets may be mailed back after each semester (5 books) or at the completion of each course(10 books). This program is designed to operate as independent study. Eaton Academy does not provide instructors for these courses. Families convenient to Roswell, Georgia, may enroll in on-site tutorial sessions at an additional cost. What resources are used in the Distance Learning Program? Each course is divided into structured, manageable booklets, usually ten booklets per complete course. These materials contain some Christian religious elements which students may choose to investigate. Eaton Academy is not affiliated with any religion and maintains a non-discriminatory admissions policy. What are the requirements for the Distance Learning Program? Parents must register with their local school district that they are home schooling their children. Parents may administer the Distance Learning Program provided they have a high school diploma and have completed some academic credit beyond high school. Individuals other than a parent may supervise the program provided they hold a college degree. As part of the application, Eaton Academy must receive documentation indicating who will be mentoring the student and what credentials that person holds. Tests must be proctored by someone other than the parent. The identity and qualifications of the proctor must also be included with the application. To receive a diploma from the Distance Learning Program, students must provide Eaton Academy with one set of nationally standardized test scores from their high school years, such as the ITBS, Standford, ACT, PSAT, or SAT. Specific graduation course requirements for a career technology diploma are available upon request. What is the cost of the Distance Learning Program? There is a one time application fee of $250.00. Each complete course (1 credit) is $700.00 per student. Each semester course (1/2 credit) is $400.00 per student. These prices include materials, documentation and shipping. What types of students do you have? Eaton Academy is a co-ed day school with no religious affiliation, serving students in K-12 and post-secondary. Unlike some schools, there is no typical Eaton student. Eaton respects and celebrates individual differences among students. 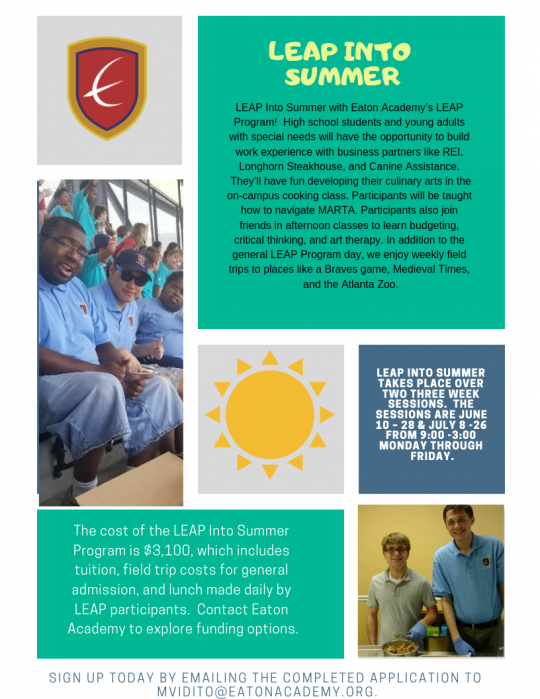 Given the variety of programs available at Eaton Academy, we are able to serve a wide range of students. What makes Eaton Academy different from the other private schools in the area? Do Eaton students go on to college? Yes, many Eaton graduates go on to college every year. Here is a list of recent placements. Does Eaton have a school uniform? No, Eaton Academy students follow a dress code. Do Eaton students receive report cards? Yes. Communication is an important element of a student’s placement at Eaton Academy. Reports are issued at various intervals depending on the program. Eaton Academy follows a standard four point grading scale. Yes. Parents may order and purchase lunches Monday-Thursday through our lunch program. Students are also welcomed to bring lunch from home. Does Eaton have extended day? Yes. After school enrichment activities are available. Extended day is available for an extra fee Monday-Friday until 6pm. Does Eaton offer honors or AP courses? Yes. These courses are available when appropriate. Do Eaton teachers assign homework? If so, how much? Yes. Homework is an integral part of our curriculum and serves an extension of the classroom experience. Amounts vary by grade. Yes. Eaton Academy is accredited by AdvancED and Georgia Accrediting Commission. Why would one choose Eaton Academy? Eaton Academy offers small class size, customized curriculum, flexible scheduling and a variety of programs to meet personal needs in a nurturing environment. If my child is an athlete or a performer, does Eaton have a program that will work for him or her? Yes. Mentor and Independent Study program provide individualized instruction and flexible scheduling. Is there a specific program that offers individualized instruction? Yes. Eaton Academy’s Independent Study Program offers a completely individualized approach to academics. Is financial aid available? Do you accept SB10? Are payment plans available? Eaton Academy accepts students with SB10 awards (Georgia Special Needs Scholarship). We are affiliated with the Georgia Student Scholarship Organization (GSSO). Payment plans are available through the FACTS financial management system.